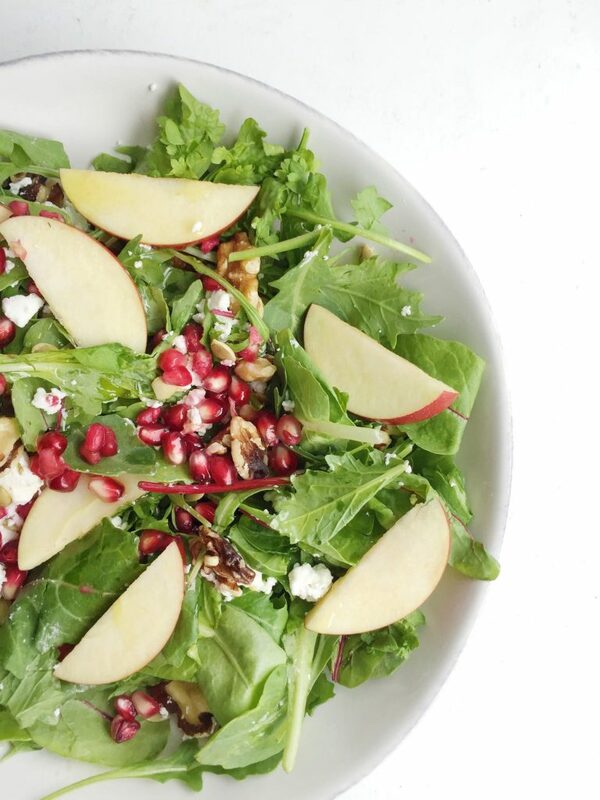 Bitter greens plus sweet toppings make this Fall Superfood Salad your new favorite. In case you haven’t heard, it’s Fall and people are apple picking, pumpkin picking, eating pumpkin, eating apples, drinking apple cider AKA doing anything centered around pumpkin & apples. Now I don’t want to sound like a walking cliche but I do love apples & pumpkins (like most basic white chicks) but I don’t only eat them during the Fall so that makes me feel a little less lame. With the abundance of apples in my kitchen from the orchard and organicgirl’s NEW Pepper Greens mix, I wanted to make a sweet Fall Superfood Salad. 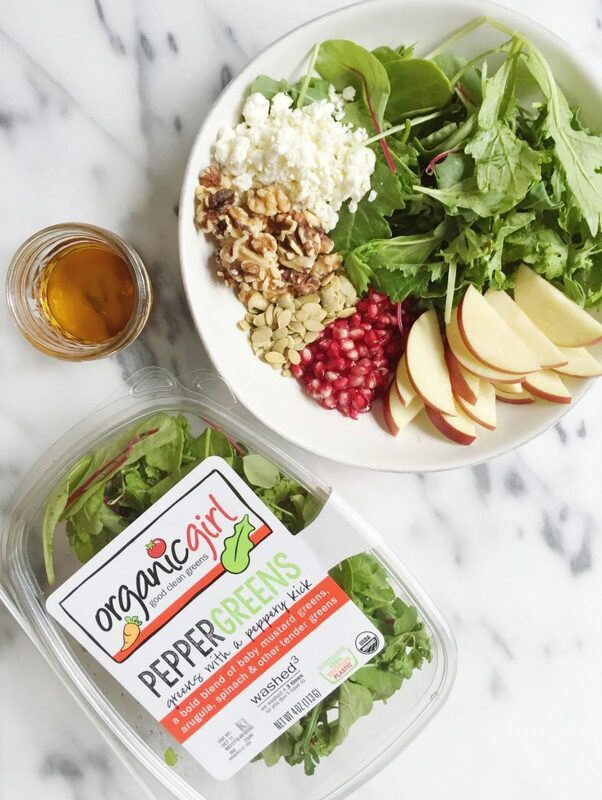 Their Pepper Greens mix is filled with arugula, baby green mustard, baby red mustard, cress, baby spinach, baby green bok choy, baby green chard, baby red chard, baby red bok choy, mizuna, komatsuna, like HOLY HATS! That’s some line up in there. And yes, I added “superfood” into this recipe title because we all know superfoods are trendy, they change with season and they do our bodies GOOD. I can’t even begin to actually explain why exactly superfoods are good for you but I don’t question it because when I eat them I feel good, I feel satisfied and that is what matters to me. 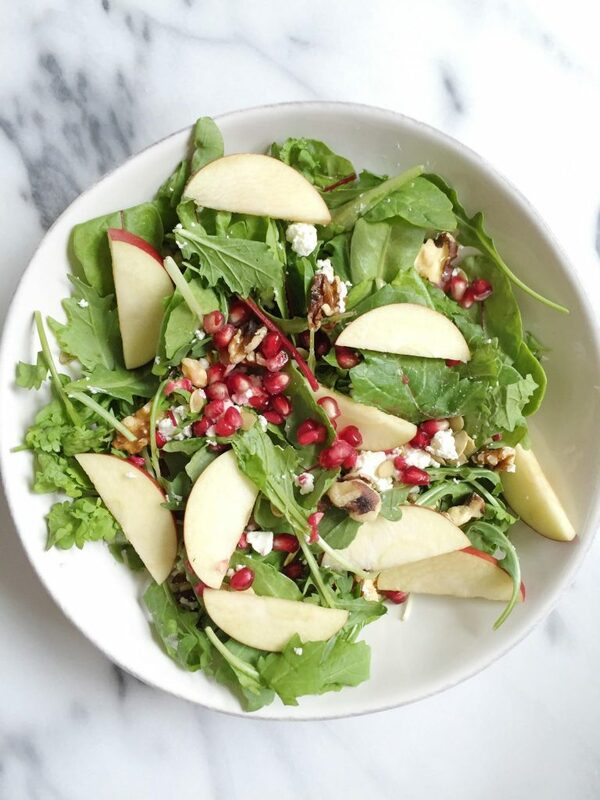 This Fall Superfood Salad is filled with fresh organic apples, pumpkin seeds, walnuts, goat cheese and pomegranates. Tossed with a maple syrup dressing, it compliments the bitter Pepper Greens mix that organicgirl offers. 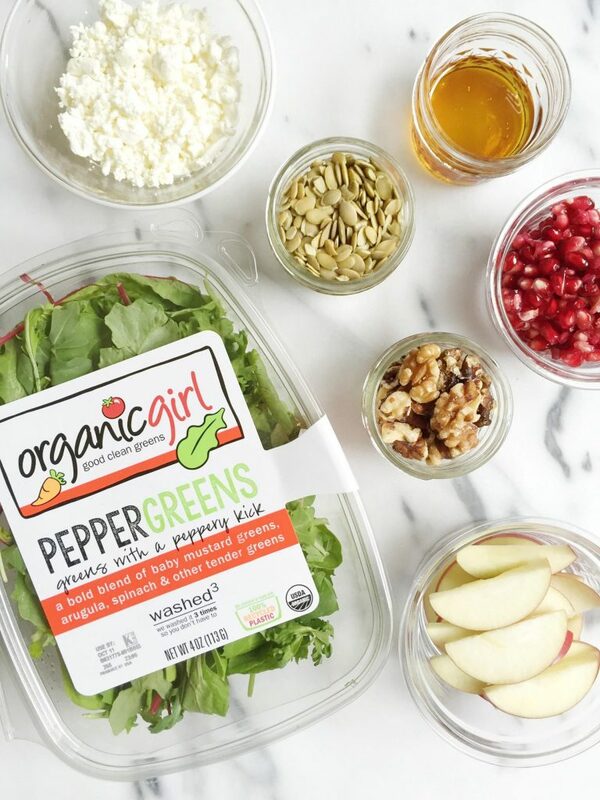 You can read about my love for organicgirl in my last Pad Thai Salad creation with their new Sweet Pea mix. But now I want to tell you how to make my Fall Superfood Salad. It can be enjoyed as a side dish, a light lunch or you can add some protein on top to make it an entree. This salad looks so good! I have been missing pomegranate in my life…I need to get some and whip this up ASAP. Pinned! Pomegranates, apples, walnuts…oh my. My favorite things!!! I could eat them all by themselves but I GUESS I’ll throw them on some greens to make it even healthier….